Ivanti offers feature-rich technology that integrates smoothly into your solutions with lower resource overheads. You can continue to devote resources to develop your core product strengths that add value and separate you from your competition. Give customers high-performance scanning in near real time with impressively minimal system requirements. Add a solution that can automatically discover, scan, and remediate physical machines—and virtual machines—whether they’re powered on or off. Be able to choose from agentless and/or agent-based scanning and remediation options to fit into on-premise, mobile, or cloud-based solutions. Give users the latest verified patch releases for Windows, macOS, select Linux versions, and an ever-growing list of third-party applications. We’ve thought of it all. Seriously. Ivanti’s wide range of OEM patching solutions are the perfect choice to strengthen your product while minimizing costs. Extend customers' investments in Microsoft System Center Configuration Manager using a single workflow. Support for hundreds of vendors and apps, even the most difficult like Java and Google Chrome. Add automated patch support for a growing list of third-party apps, plus simple data importing that doesn’t require additional software or training. Supports important third-party apps, including many from Adobe, Java, OpenOffice, and more. Gain flexibility so that your application can control reboot timing. Coverage for CentOS, Red Hat, and SUSE 64-bit Linux OS, and more. We enable your solution to scan and apply patches for macOS, as well as Apple and third-party applications—all with minimal user disruption—that allows your application to control reboot timing. Boost your product so it can quickly find missing OS patches and out-of-date, vulnerable software. Provide flexible support for download location, scheduling, reboots, and more. 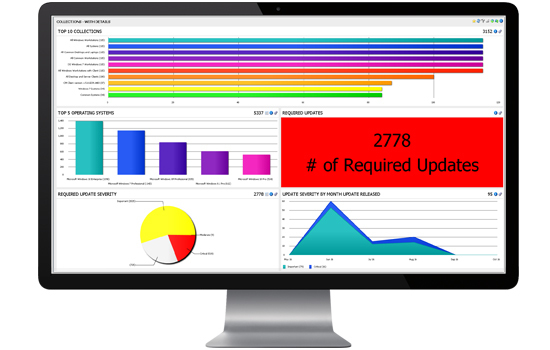 Deliver results and associated metadata for customizable user interfaces and reporting functionality and design. Give customers the ability to cut through the mass of IT data to the insights that matter most. Deliver real time, IT business intelligence to spot trends, risks, and opportunities. Give your customers access to a single comprehensive view of multiple IT data sources so your solution can drive intelligent decision making. Enable anyone to connect to data, build reports, design dashboards, drill down, and filter data in real time. Reduce the burden on IT reporting specialists. Give your solution the ability to provide key data to stakeholders. Enable customers to view and share dashboards in meetings or export to major file formats. Your users will be able to visualize personalized data in real time, or point in time, and schedule report-delivery times to suit them. Give your users the freedom to access your products from anywhere by embedding our cost-effective remote control solutions designed for nearly every role in IT. All you need is a simple API in order to access the web service to load and remove the client. Admins, analysts, and users can launch it from a web page or portal. Add end-to-end SSL encryption for all communication. No storing of credentials; agent is loaded when called and removed when finished. Empower your solution to use any HTML5 browser to control devices remotely, adding the ability to execute commands, and even launch applications. Your solution will be able to simultaneously control users’ machines remotely and use communication tools to quickly educate and resolve issues. The advanced technology in Ivanti's Application Manager gives your team unprecedented endpoint control that reduces risk without compromising the user experience. Our solutions easily mitigate threats without disrupting productivity. Think of it as an impenetrable force-field of bubble wrap. Get zero-day protection from malicious and targeted threats by getting rid of local administrator accounts. Maintain control by only giving users privileges when they need it. Prevent unauthorized code execution and enforcement of software licensing through a “trusted ownership” model and an improved approach to whitelisting and backlisting. Manage privileges at the application or individual task level instead of at the session or account level. Raise, lower, or eliminate those privileges based on a per-user, application, or task basis. A new level of application control and privilege management that achieves a practical, cost-effective balance between IT compliance and user demand and productivity.